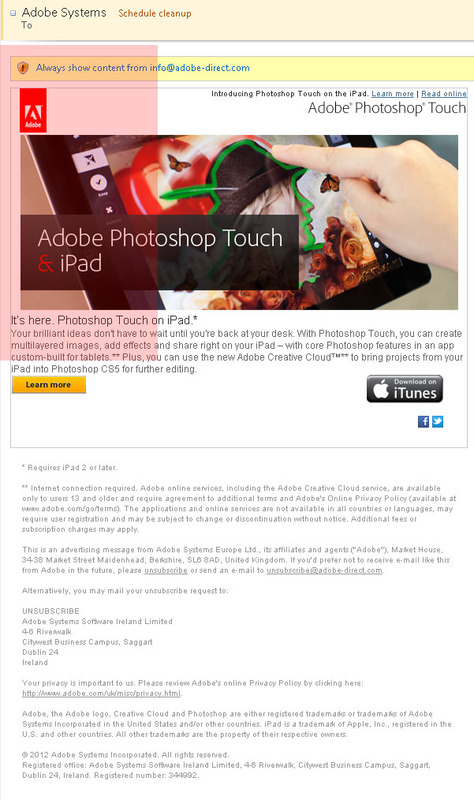 Adobe Photoshop Touch for iPad: no email conversion optimization? How would you go about introducing a new product in the Photoshop family if you were Adobe’s marketing department sending out a promotional email? Probably with lots of lavishly designed graphics, special offers or discounts for existing customers, key feature highlights, stuff like that, right? Adobe thinks differently about that. They’re not really into email conversion optimization it seems. Yesterday I received their email promoting the recently launched Photoshop for iPad and it was lacking in many departments. Let’s take a look from top to bottom. Top left it contains the logo, but no pre-header text: that is aligned top-right including the learn more link and the online version link. Product name is top right as well, and inside the single graphic. The pink overlay is 200px wide by 400px high. I put it there because that’s where people look when skimming – browsing the web specifically, and reading email even more specifically. See this post about heatmaps for further details. The pre-header text, part of the product name and the CTA (Learn more) and iTunes download link are not inside the pink overlay. Worse, the email does not inform my about what ‘core Photoshop features’ are actually put in the app. Note that in the subject line, the pre-header -and- the graphic the name refers to the iPad. However, in the small print (first asterisk) and this official blog post by Adobe the refer to the iPad 2. Hah! How’s that for a ‘made you look but this is useless for you’ move? – Price is apparently $9.99. Not a bad price, but it wouldn’t have hurt to include it in the email, right? I like to know what I can expect to pay for something like that. Let’s talk conversion. ‘Learn more’ is nice for inviting people over for an informative house owners meeting in your friendly neighbourhood. An email like this should have an animated, shiny, pimped out ‘Get it now for just $9.99!’ – preferably including a .mp3 autoplaying with that button text spoken by Arnold Schwarzenegger. After the ‘Learn more’ button on the left, and iTunes download link on the right plus two tiny social media icons (to follow them? To share the message with my tweeples? What?) there’s nothing except the small print. No features highlighted? No link to a cool promotional video like this one? Lastly, Adobe knows perfectly well who I am. I ordered Premiere Elements 10 and Photoshop Elements 10 recently. They know my name, how I use the regular Photoshop (for business, it’s CS3 I use) and such. What about offering me a discount or, because I own an iPad 1, an alternative? Like next purchase above $100, a $10 discount in the Adobe store. Nope, they didn’t score points with me with this email, as you have read by now. I love Photoshop, and think Adobe is a cool gang, but this is not right. It almost seems as if they’ve cut off part of a previously sent email and stuffed in the Photoshop Touch details, or made a fresh one but left out 50% of the content for whatever reason. I wonder how many people received this email?